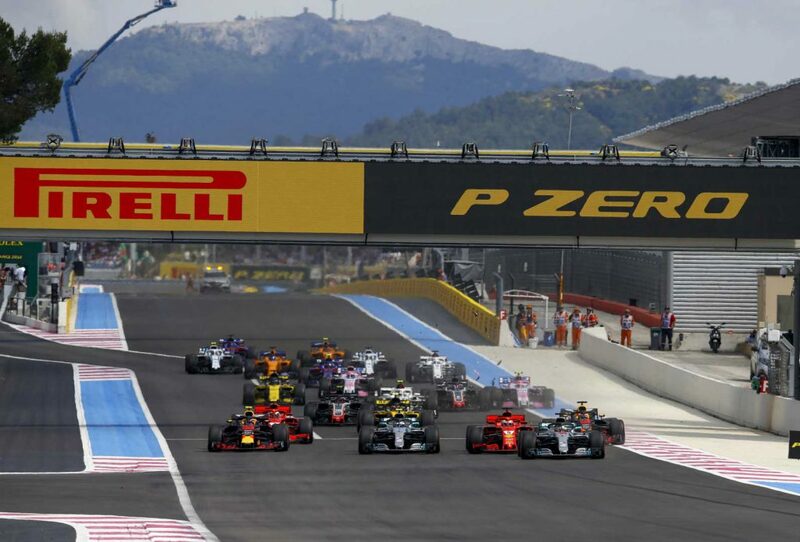 The return of the French Grand Prix after a decade off the calendar delivered the sort of straightforward race many predicted ahead of the race at Circuit Paul Ricard. Sebastian Vettel and Valtteri Bottas’s lap-one crash, dropping both to the back, was a blessing and a curse — on the one hand it created some precious overtaking opportunities as the two recovered places, but it also robbed the race of what could have been an interesting tactical duel. 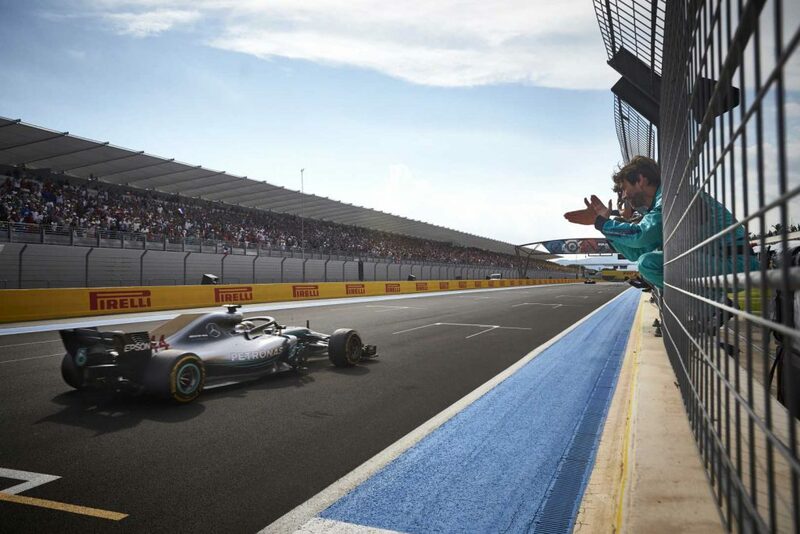 Mercedes brought an upgraded power unit to France after delaying its introduction at the previous race in Canada, and the extra two weeks allowed engineers to squeeze some extra power out of the specification, which was useful around Circuit Paul Ricard’s fast and sweeping bends. Working Mercedes’s favour too was that the circuit’s surface characteristics were similar to those found at the Spanish Grand Prix, which the Silver Arrows dominated. Pirelli brought the same thin-tread tyres to this race — in soft, supersoft and ultrasoft format — which Ferrari struggled with in Spain to Mercedes’s advantage. All things combined, Mercedes was looking good to record its first win since May. Mercedes topped all three practice sessions and segments of qualifying, with Lewis Hamilton leading Valtteri Bottas for a front-row lockout. 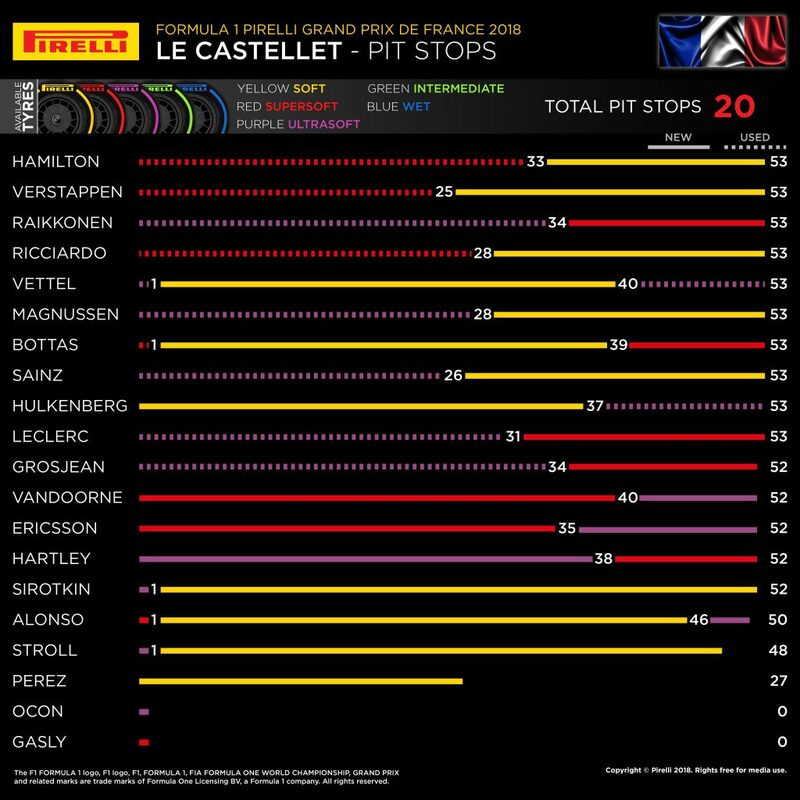 As is becoming the norm, the strategic battle at the front is in part decided by tyre choice in Q2, which top-10 drivers must start the race on. Mercedes and Red Bull Racing opted for supersofts — rain was forecast for the race, meaning a longer first stint might have allowed a direct switch to wet-weather tyres — but Ferrari, knowing it needed something to differentiate itself from Mercedes if it was to take on the dominant team, opted to start on ultrasofts. The French Grand Prix’s most important moment wasn’t a tactical decision but a crash between Sebastian Vettel and Valtteri Bottas at the first turn. Vettel executed an excellent start, but his speed only boxed him onto the apex with Lewis Hamilton ahead and Bottas to the right. He locked up and knocked the Finn off the road, damaging both cars in an incident that later earnt him a five-second penalty. Both drivers switched to the soft tyre, the most durable of the weekend, in an attempt to make it to the end of the race without another stop. Astounding was the speed with which that Vettel scythed through the field. His car repaired, he took just 14 laps to climb from 17th to fifth behind teammate Kimi Raikkonen. Bottas made slower progress due to damage to his car. It served to illustrate how fast the frontrunning cars are if only they unleashed their pace — but both also suffered for having to thrash their tyres. There was a momentary stand-off between Ferrari and Mercedes. Ferrari didn’t want to pit Vettel he would have emerged from pit lane behind Bottas, who was then in sixth. 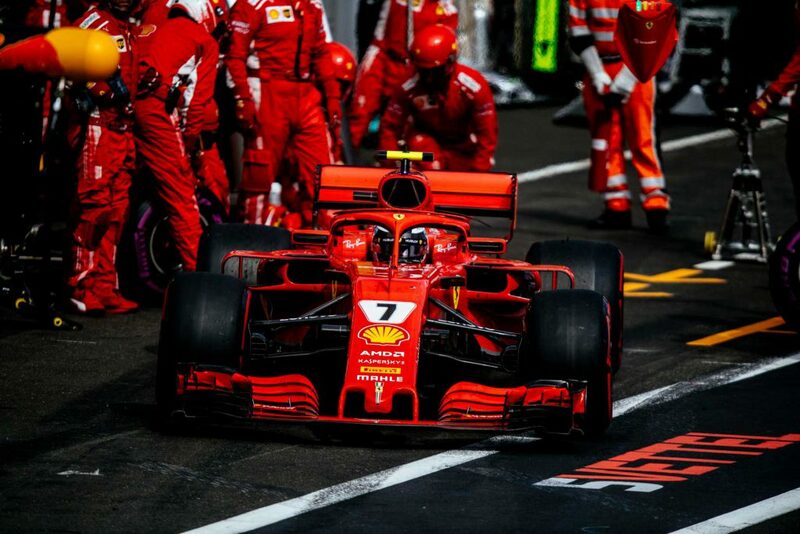 Mercedes blinked first, hoping fresher tyres would solidify Bottas’s chances of jumping the driver who knocked him out of podium contention, but a rear jack failure meant the stop was much longer than usual — so much so that Vettel was able to pit and maintain position ahead of the Finn. Bottas finished the race seventh. As an interesting point on the duo’s recovery, Vettel noted that the relative ease of overtaking was partly due to a strong headwind down the back straight which made slipstreaming and the DRS more effective. 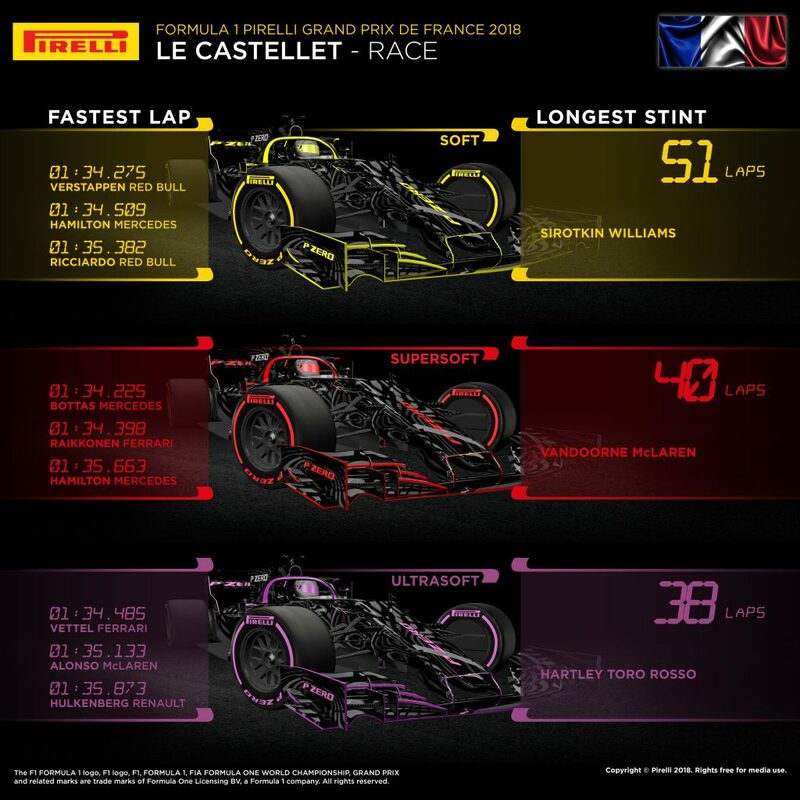 The ‘zero-stop’ strategy employed by Vettel, Bottas, Fernando Alonso, Lance Stroll and Sergey Sirotkin — stopping on the first lap behind the safety car in an attempt to make it to the end — was attractive because degradation was low, but wear remained high thanks in part to the aerodynamically demanding nature of parts of the track and Pirelli’s thinner tread. The dangers of pushing tyres too far was boldly illustrated by Stroll, who locked up his front-left tyre late in the race so significantly that it failed a few laps from the finish, pitching him off the track. Sirotkin was the only driver to take the chequered flag without making a change after lap one, with Fernando Alonso having made a lap-46 change to new ultrasoft tyres in an attempt to record the fastest lap. Unfortunately for him, his suspension failed and he was forced to retire from the race, albeit classified P16. An increasingly defining characteristic of 2018 racing is that drivers — or perhaps teams — are unwilling to push the maximum of their performance envelopes. 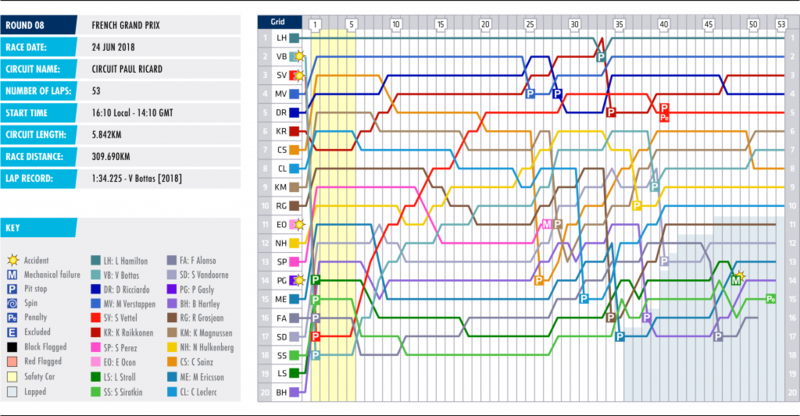 This is partly down to managing their power units, of which each driver has only three for the entire 21-race season, but it is also thanks to overtaking being particularly difficult in the current aerodynamics-heavy regulatory era. 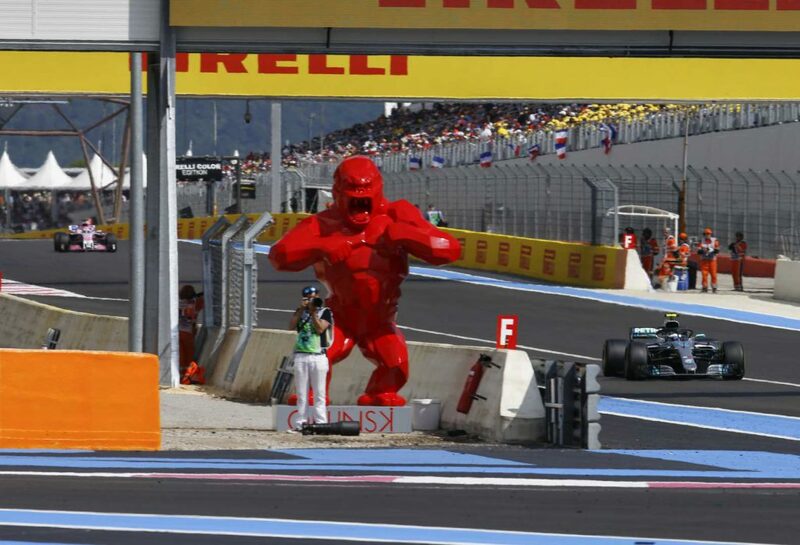 The French Grand Prix was tipped to feature little overtaking thanks to its relative lack of heavy braking zones. This combined with the Circuit Paul Ricard’s long pit lane, the speed limit for which was reduced to 60 kilometres per hour due to the nature of the bend on pit entry that potentially put the Mercedes garage in a perilous situation were a car to lose control there, meant teams were predisposed to stop just once and therefore order their drivers to eke out the maximum life from their tyres. Kimi Raikkonen’s 34-lap stint on ultrasofts, the softest and least durable tyre of the weekend, is a case in point. His teammate, Sebastian Vettel, was able to extract just five extra laps from his soft compounds, the most durable of the range, because he was forced to push flat out after the safety car to recover position. Aerodynamics, not the tyres, is the limiting factor in racing.